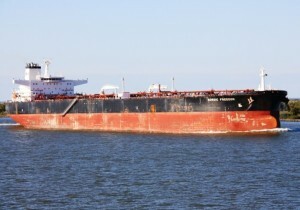 The tanker has been found 70 meters deep in the Gulf of Gdansk. It is difficult to calculate the number of destroyers, submarines or combat aircraft of the Second World War that lie at the bottom of the sea. Almost every month the discovery of a missing ship during the war is announced. Now, according to the Polish portal TVN24, a German World War II tanker has been discovered that could cause a natural cataclysm. The ship, called Franken, has been found 70 meters deep in the Gulf of Gdansk (Poland). It is an oil tanker that was sunk by Soviet aircraft on April 8, 1945. Inside it transported more than a thousand tons of fuel that currently remain inside the ship. A situation that has been cataloged by the scientists of the Maritime Institute of Gdansk and the MARE foundation as an ecological pump. On Tuesday of last week, several environmental groups presented a report with the results of the analysis of the wreck. According to the study, there could still be thousands of litres of fuel inside the vessel, as well as a significant amount of lubricating oil and ammunition debris. We have limited time for action. It can only be a year, maybe 10 years, but probably not longer, “explains Dr. Benedykt Hac of the Maritime Institute of Gdansk on the situation of the tanker. The scientist assures that, in case that the fuel began to leave the sunken ship, it would be very complicated to handle the situation. Olga Sarna, of the MARE foundation, agrees with the doctor’s opinion. Sarna says that if the fuel is spilled “it will be an environmental disaster” that would seriously endanger the marine fauna near the wreck. The foundation affirms, on the other hand, that the spill not only would be very harmful to the ecosystem of the area but could also affect the economy of all the north of Pomerania.